Acute Triangle : A triangle whose all the angles are acute ( < 90 0 ) is called an Acute-Angled Triangle or Acute Triangle. 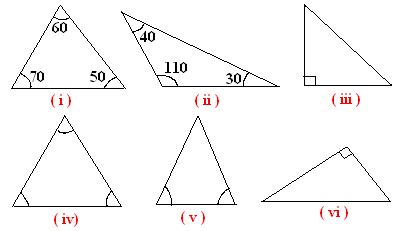 Right Triangle : A triangle whose one angle is a right angle ( = 90 0 ), is called a Right-angled Triangle or Right Triangle. A triangle can not have more than 1 right angle. Note : The remaining two angles in a triangle are acute angles. Obtuse Triangle : A triangle whose one angle is obtuse (≥90 0 ) is called an Obtuse-Angled triangle or Obtuse Triangle. A triangle can not have more than one obtuse angle . In ΔDEF, ∠E is an obtuse angle and other two angles are acute angles. 1) If the measure of two angles is same then it is Isosceles Triangle. 2) If the measures of all the three angles are same then it is an Equilateral Triangle. Q.1 Classify the following triangles on the basis of their measurements. Q.2 Fill in the blanks . a) A triangle whose all the angles are of measure less than 90 0 is known as ----------. b) A triangle whose one angle is a right angle is known as ----------. c) A triangle whose one angle is more than 90 0 is known as ------------. ( i ) Acute triangle. ( iv ) Equilateral triangle.